Your computer deserves the best keyboard and especially in this era that technology is changing rapidly. Computers have evolved over the years, and the keyboards have gone through various changes to suit their usage. 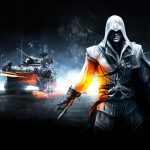 The market as well has a lot to offer when it comes to keyboard from gaming keyboards, multimedia keyboards, backlit keyboards, and mechanical keyboards. In this article, we look at 9 best Chiclet keyboards also known as island-style keyboards. What is unique about Chiclet keyboard? Most tech-savvy already know about chiclet keyboard. We explain the technical term to the non-techies in the most natural way possible. A chiclet keyboard has elevated rectangular-shaped keys in style of Chiclets with some space between them. The spacing between each key in a chiclet keyboard lessens the chance of hitting the wrong key. Chiclet keyboards are faster, soft, accurate, with less noise compared to other traditional keyboards hence ideal for people who use their computer regularly. Now that you know what a chiclet keyboard is and the features, we believe you might need one for your computer. To help you, we selected the best chiclet keyboard in 2018 based on quality, price, and features. These chiclet keyboards are practical, and pretty you can’t go wrong with them. Best Chiclet Keyboard In 2018 Reviewed. Why we recommend it; Logitech MK360 keyboard comes in a compact design that’s ideal for small workspaces, dedicated hotkeys for media and internet, and an extended life battery that can last up to 3 years. With Logitech wireless combo you don’t have to worry about working space since it comes in a sleek, thin and compact design ideal for tight workspaces. It’s 20% smaller than a full-size keyboard or other Logitech’s standard keyboards. The keys are low-profile to help you enjoy comfortable and fluid typing with quite. Logitech Mk30 is energy efficient thanks to the long life mouse and keyboard batteries which you don’t need to charge every month. The manufacturer states that the mouse battery lasts up to 18 months and the keyboard battery can last up to 3 years. User experience varies and the battery life, of course, depends on computing and user conditions. Logitech Mk360 allows you to experience entertainment at your fingertips thanks to the enhanced F-keys, and the four hotkeys which enable you to play and pause a YouTube clip as well as turn up your volume. Better still, you can enjoy smooth scrolling with the responsive mouse and smooth cursor control. The mouse is compact and contoured to keep your hands comfortable and for secure storage in your laptop bag. Logitech Mk360 also features a tiny wireless receiver that you just plug-and-play into the USB port and just like that your mouse and keyboard are ready to use. You can scroll, type browse and search easily and comfortably with this compact mouse and keyboard. Dell KM117 comes in second in our list of best chiclet keyboards in 2018 for many reasons. It provides the functionality that you need in a mouse and keyboard without wires. It’s reliable wireless connectivity making it an ideal for everyday use. Unfortunately has no on/off switch but the mouse and keyboard goes to sleep automatically when you’re not using. KM117 from Dell is a great wireless keyboard that fit in any desktop setup allowing you to enjoy a neat workspace thanks to its compact and sleek design. The keyboard features a full-size keyboard which will enable you to type, and the chiclet keys are fantastic. The optical mouse is easy to use, and hotkeys are suitable for media and internet control. Dell wireless connection is a reliable one as you effortlessly connect your mouse and keyboard with nano dongle through 2.4GHz which attaches easily to a USB port giving great lag-free typing experience. The wireless connection working range is up to 10-meters. Both keyboard and mouse batteries of Dell Km117 give you a service of up to 12 months. It’s worth noting that the keyboard operates with an AA battery while the Mouse operates with AAA battery. Most customers who have used Dell Km117 keyboard combo recommend it stating that it's easy to use with high-tech features and excellent value for money. 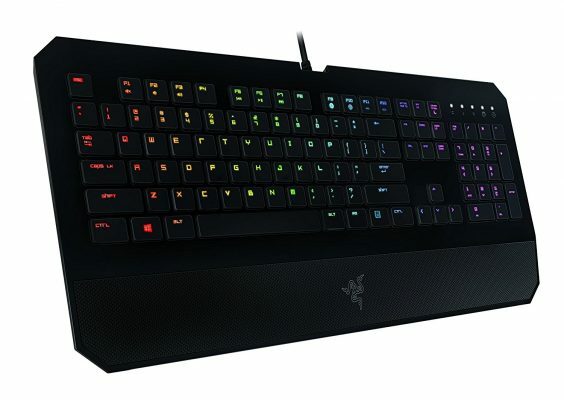 DeathStalker Chroma from Razer is a customizable keyboard with a gamer in mind. It is not only pretty but functional with backlit customization features and programmable chiclet keys. The Deathstalker Chroma membrane gaming keyboard is designed with rapid-fire actuation and low-profile slim chiclet keys which allows your fingers to type faster comfortably. Furthermore, the keyboard prides itself with fully programmable keys which allow you to have a smooth gaming experience by registering up to 10 simultaneous key presses thanks to the anti-ghosting technology. You activate the keys at the same time, and they respond accurately in-game without lagging. DeathStalker Chroma keyboard boasts backlit customization features with 16.8 million colors which allow you to produce unique lighting effects through Razer Synapse. This backlit keyboard with individually illuminated keys is ideal for night gaming sessions. 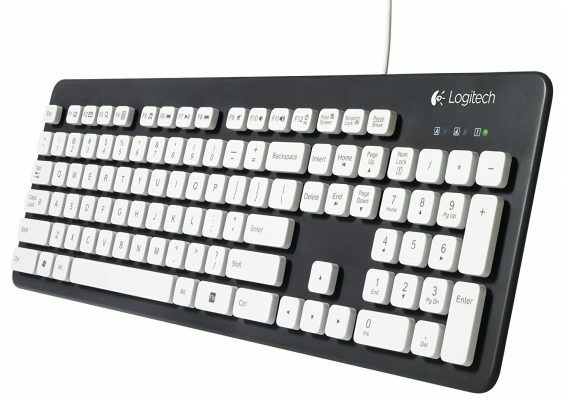 K310 from Logitech is another excellent chiclet keyboard that we recommend. It’s durable with a washable keyboard and offers a comfortable typing experience to the user. For people who have a history of spilling drinks on their keyboards or you just like eating at your desk as you work, Logitech Washable Keyboard K310 is perfect for you. This keyboard can be submerged or hand-washed making it the most natural device to clean in the office. Better still, its waterproof, dust-resistant and spill proof so you don’t have to freak out if you spill your drink or drop crumbs on the keyboard. Beyond the K310’s sanitary features, it also comes in a stylish looking design which looks and feels great. The keyboard is quiet-typing, and the keys are durable with UV coating and laser printing to give your fingers a comfortable typing experience. Logitech K310 keyboard features Plug/play function meaning you don’t need software to install, plug your keyboard in your computer and immediately start typing. Furthermore, the keyboard has 12 shortcuts hotkeys to access email instantly, pause your music with one touch or launch a web search. 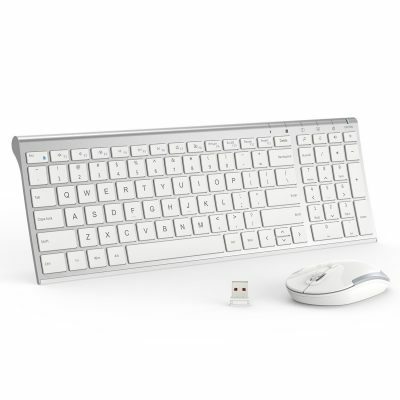 The Aluminum wired keyboard from Apple is another excellent keyboard on our list that we recommend due to its features which includes a numeric keypad, an extended layout, Anodized aluminum enclosure and low profile keys. Apple is known for producing quality devices with superior design, and Aluminum wire keyboard is no exception. The first thing you note about Aluminum wired keyboard is ultra-stylish and slim design. The aluminum wired keyboard is sleek, sturdy and the Chiclet keyboard gives you a comfortable typing experience all day long. 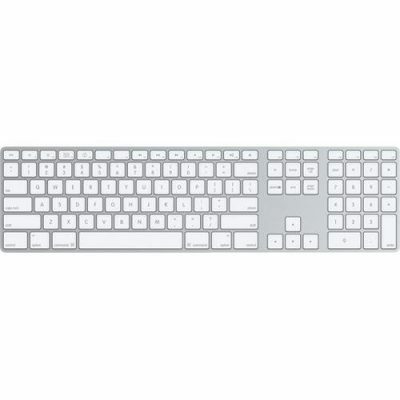 This Apple keyboard boasts low profile keys and a numeric keypad, but unfortunately, it doesn’t feature backlit keys. It also features apple function keys ideal for one-touch access to Mac features which includes play/pause, screen brightness, fast-forward, and rewind, volume and eject options. Its worth to note that this is a standalone keyboard that doesn’t come with a mouse you will have to buy the apple mouse separately. Dell KM717 is built for ergonomics and comfort. It features multimedia keys, a 3-section layout, well-spaced chiclet keys, and an optical tracking mouse. This full-sized keyboard offers you comfort whether you use it in the office or at home. Dell KM717 keyboard and mouse features an ergonomic design that is reliable and offers you comfort as you work throughout your workday. The mouse is arc-shaped with five buttons that provide convenient shortcuts to the user's fingertips. Km717 mouse and keyboard combo is built with premium materials and comes in an elegant design which can fit into any workspace. With Dell KM717 you have the freedom to select your wireless connection, and you can switch between a laptop, desktop, and mobile devices at a time thanks to Bluetooth LE or 2.4GHz wireless. Dell KM717 features 1600 dp1 laser that enhances your daily productivity and returns on any surface including high-gloss and glass. Furthermore, this keyboard features a 3-section layout with the favorite shortcuts keys for Android and Windows plus multi-OS and Mac-OS. It's important to note that you will need 2 AAA batteries for this Keyboard. Anker wireless keyboard is another one on our list that we like since it features a portable design, low profile keys, and a stable connection. 2.4 GHz Wireless Keyboard from Anker comes in compact and lightweight design which is easy to carry and suitable for any workspace. 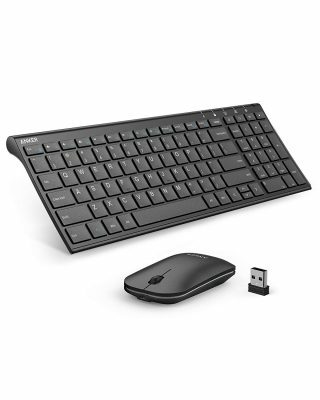 Anker 2.4GHz wireless mouse and keyboard combo comes in a lightweight and compact design making it ultra-portable. With this wireless keyboard, your workspace remains neat and uncluttered. The keyboard features low-profile keys that are slightly concaved and soft upon impact. The 2.2mm actuation point and low-profile keys make this keyboard ideal for speedy typists. 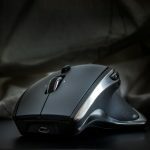 The mouse is also impressive as it can perform on all surfaces including wood, denim, laminate, carpet, and marble. The mouse is vast and features a large arch, so your palm sits on it comfortably. Unfortunately, the mouse isn’t ambidextrous hence not ideal for lefties. The mouse also features a DPI button which slows down or speeds up the cursor. The DPI button has three lights you need to adjust it, and the lights will flash indicating the speed that the cursor is set. The first light is for slowest setting, the second for medium and the third for the fastest and most sensitive cursor speed. The downside of Anker wireless keyboard is that the battery lasts up to 3 months compared with other keyboards that have batteries that can stay up to 3 years without charging. The wireless mouse and keyboard combo from Jelly Comb is a full-size keyboard with a precision mouse and numeric keypad. With this keyboard, you can comfortably work away from your laptop, computer, notebook, and desktop. Jelly Comb wireless keyboard features a compact design making it 25% smaller when compared to a full-size keyboard. However, it doesn’t mean that it performs less than its large counterpart. This keyboard provides you with all the functionality to meet your daily typing needs. Jelly Comb keyboard gives ergonomic comfort as it comes with a stand at the back which allows the keyboard to fit your wrist and palm for comfort. The sleek mouse and keyboard combo feature low profile keys for smooth and comfortable typing. It also boasts a mouse that has an adjustable switch and 3 DPI levels at the top. You can quickly adjust your mouse sensitivity between the 3 DPI levels (1600/1200/800) to suit your gaming and everyday needs. Better still; the keyboard has an optical laser that allows smooth tracking, precise movement, and quick response. Furthermore, the 2.4GHz wireless connection is reliable and allows the keyboard to connect with enabled devices up to 33 ft or 10m range. Has one USB receiver for the mouse and keyboard that allows quick and stable connection for your laptop when typing without delays. Jelly Comb wireless keyboard is compatible with Windows 7/8/10/XP, and Vista, but unfortunately with Mac system, it’s not fully compatible. iClever GK03 wireless mouse and keyboard combo is a compact full-size keyboard. The sleek design is aesthetically pleasing, and the material is durable. The iClever wireless keyboard comes in ultra-thin design making it compact enough to fit in your bag. It's also portable and versatile to meet your typing requirements. The GK03 keyboard features 2.4GHz technology for a stable connection. 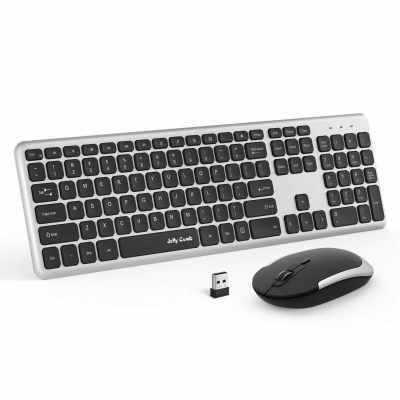 With this wireless keyboard and mouse, you enjoy working flexibility and the sharable nano receiver makes it easy to achieve plug/play function within a range of 33ft at the same time. The iClever wireless keyboard features whisper-quiet buttons, well-spaced square keys that are smooth making typing a breeze. You can adjust the mouse sensitivity to suit your typing needs. The rechargeable keyboard offers you 90 hour working time when fully charged. When buying a keyboard for your computer goes for one that has an ergonomic design for comfort and efficiency when working or gaming. Portability is also essential to ensure that it’s easy to carry your keyboard wherever you go. 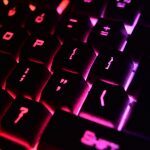 For a gamer, the keyboard should have things like programmable keys, backlighting, integrated LCDs, and changeable number pads to enhance your gaming experience. For media users whether you do desktop publishing or data entry look for a keyboard that features elevated wrist rests and curved keys. How a keyboard connects to your device is paramount. For a wired keyboard consider the cable length and the interface offered by the keyboard. Most people will go for a keyboard which connects via USB. If you need to use the keyboard with a tablet or a phone a Bluetooth keyboard is ideal. Understanding why you need a keyboard helps you to get one which has features that you require and guides on the amount you should spend on it. 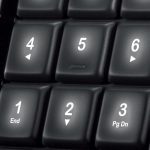 Choosing the best chiclet keyboard for your computer is not an easy task for most people. We hope that our review for the best chiclet keyboards in 2018 makes it easy for you to pick the right keyboard for your usage.